Atopica is an oral solution prescribed to dogs who suffer from allergic dermatitis—a skin reaction caused by contact with an allergen. This is very common in canines with allergies, and can cause their skin to become uncomfortably itchy, red and scaly. Atopica targets the root of the problem to help relieve itching, so your companion no longer feels the need to incessantly scratch, rub or lick. 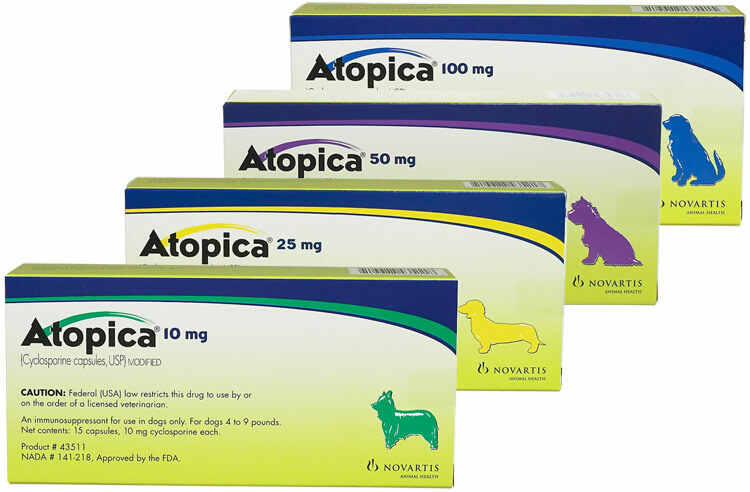 Atopica can help provide your dog the relief she needs. The initial dose of Atopica is 5 mg/kg/day (3.3-6.7 mg/kg/day) as a single daily dose for 30 days. Following this initial daily treatment period, the dose of Atopica may be tapered by decreasing the frequency of dosing to every other day or twice weekly, until a minimum frequency is reached which will maintain the desired therapeutic effect. Atopica should be given at least one hour before or two hours after a meal. If a dose is missed, the next dose should be administered (without doubling) as soon as possible, but dosing should be no more frequent than once daily. View Atopica Drug Facts Sheet. 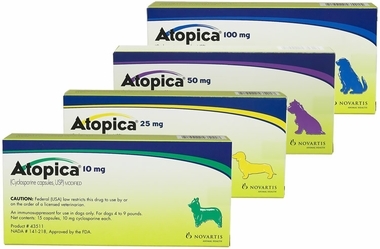 Contraindications: ATOPICA is contraindicated for use in dogs with a history of neoplasia. Do not use in dogs with a hypersensitivity to cyclosporine. Warnings: ATOPICA (cyclosporine) is a systemic immunosuppressant that may increase the susceptibility to infection and the development of neoplasia. Human Warnings: Not for human use. Keep this and all drugs out of reach of children. For use only in dogs. Capsules should not be broken or opened. Wear gloves during administration. Wash hands after administration. In case of accidental ingestion, seek medical advice immediately and provide the package insert or the label to the physician. MY DOG HAS A SKIN DISEASE THAT HAD HIM ITCHING AND PULLING HIS HAIR OUT. HE LOOKED PITIFUL. MY VET FINALLY DIAGNOSED HIM WITH A SKIN DISEASE THAT I WILL NOT ATTEMPT TO SPELL. ANYWAY, AFTER TAKING THE MEDICINE, HE STOPPED ITCHING AND HE NOW HAS GROWN ALL OF HIS HAIR BACK. HE LOOKS AND FEELS MUCH BETTER. The Atopica works fairly well for our dog. Getting him to take the medicine is the hard part. If this drug came in chewable form, it would be very helpful. ConsThe smell and taste must be terrible. Even in a pill pocket, he refuses to take it. We have been purchasing this product for over 2 years from Entirely Pets Pharmacy. This product has essentially kept our dog healthy from symptoms of Evans syndrome. With the competitive prices and results of the product we will continue to purchase here. Just what I wanted at a lower price! Yeah! My vet charges over $70 for this product. work great on my 5 yr old German Shepherd, he has been on this medication for over a year. I have my german shepherd on for 6 months and I just went to every 3rd day, hope it still works well. If not I will go back to every other day.